It can be useful to identify the words that are unusually common in posts that match a particular query/filter because they may point to important aspects of the topic discussed. This splits the data into two parts: A and the rest. It finds words that occur more often in A than in the rest of the texts. This is achieved as follows. Enter the query in the normal top-left search box and/or any gender, sentiment or other features, just as if you were going to run a search. Click Mine associations for search and/or filters (slow). 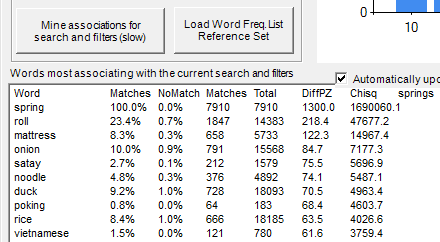 Examine the bottom right text box (see below) to see a list of words that associate with your query and/or filters. These words are unusually common in texts matching the query compared to the remaining texts in the project listed in descending order. [optional] To copy the results to a spreadsheet or word processer for analysis, right click in the box of results, and click Select All from the menu that appears, then click Copy from the menu and then paste the results Ctrl-V) into your spreadsheet or word processor document. In the example below the query is spring and no filters were selected. At the top of the list, ignoring spring, the term roll associates with spring because 23.4% of the texts containing "spring" also contain "roll". In contrast, 0.7% of the remaining posts contain "roll". The chisquare is a statistical test of this association. The chi square value indicates how statistically significant the difference is between the frequency of the terms in the topic-specific collection of texts compared to all texts collected, with higher values indicating more significant results. If you run many statistical tests at the same time then the chances of drawing a false conclusion from at least one of them is very high. This problem occurs with Mozdeh when it calculates many chisquared values at the same time (controlling the familywise error). To reduce the risk of falsely believing that a term is significant, Holm-Bonferroni procedure is used by Mozdeh. This tests all the words at once and reports the significant terms using a single test, controlling the risk of false positives due to multiple tests. To use this procedure, look at the stars in the right hand column (below). One star * is significant at the (familywise) 5% level, two stars ** is significant at the (familywise) 1% level and three stars *** is significant at the (familywise) 0.1% level. Technical note: The total number of tests used in the Holm-Bonferroni method is the number of words that have a high enough frequency to be capable of generating a statistically significant result. This is normally the number of words that occur in at least 2 or 3 different posts. The example below illustrates the star system. At the 5% level, 11 terms are statistically significant (the top 11 terms, from 'leave' to '#copelandbyelection'). At the 1% level, 9 terms are statistically significant (the top 9 terms). At the 0.1% level, 5 terms are statistically significant (the top 5 terms). The above methods find words that associate with one term and/or filters compared to the rest of the project. You might want to compare a set of queries against each other. This splits the data into two parts: A and B. It finds words that occur more often in A than B and words that occur more often in B than in A. To do this, select the Association mining comparisons tab and enter your queries in the new text box, separated by commas. 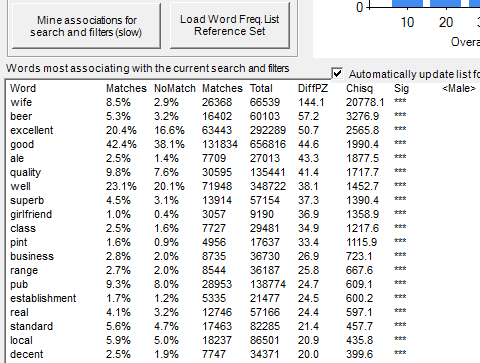 Then click Compare words matching the above queries (slow). The results will be saved into a set of files (not displayed on screen) that need to be loaded into a spreadsheet to be analysed. The list below will find words that associate with bus in comparison to train, with bus in comparison to car, and train in comparison to car. After loading into a spreadsheet and formatting, you might see results like below. This is for the query like [1 62] against the query like [63 67]. It is a comparison of terms associating with the term like earlier posts (months 1 to 62) against words associating with it in later posts (months 63 to 67). Square boxes can be used to delimit dates with queries in this way. Holm-Bonferroni statistics are given for these for the whole set of tests at once (i.e., not separately for positive an negative). To find words that associate with male or female commenters for a query, enter the query in the box above, check the Compare male vs. female for each query and click Compare words matching the above queries (slow). Two examples are illustrated below. If you have a small dataset then you can expect few, if any, significant differences (as above for 3000 UKIP tweets). For large data sets there may be many differences (as below for 1.6 million TripAdvisor comments). To find words that associate with recent or old posts, enter the start and end number of the dates to be searched in square brackets in the query as below. 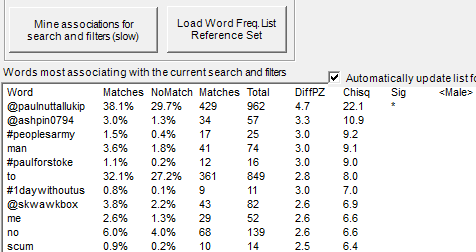 As usual, to run the comparisons, click Compare words matching the above queries (slow). In the example below the comparison is between texts containing the term room in the first 20 dates against terms containing room in dates 50 to 100. Date numbers can be found in the First date to show drop-down box in the Advanced Search tab. In the example below, the fifth date is 8 November 2003 (UK date ordering). 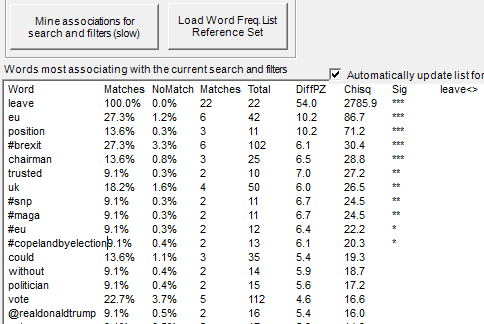 To identify words that associate with your entire project, a generic list of word frequencies is needed that the topic words can be compared against. This should be a plain text file with a list of words and their frequencies from a common, generic collection of texts. A file of word frequencies for a large collection of UK and Ireland tweets will be used unless you have your own. Click the Load Word Freq List Reference Set button on the bottom right of the screen, follow the instructions, clear the search box, and click Mine associations for search and/or filters (slow). The results will appear in the text box below it.